Possibly the last of six cars utilised in the filming of McQueen’s final film. What would eventuate as Steve McQueen’s final film, "The Hunter" was filmed in 1979, and utilised six 1979 Pontiac Trans Ams for the filming of the movie. Two cars were destroyed during filming, with another four bolstering the fleet as extras. Recently, one of these ’79 Trans Ams was unearthed from a dilapidated looking barn in Illinois. 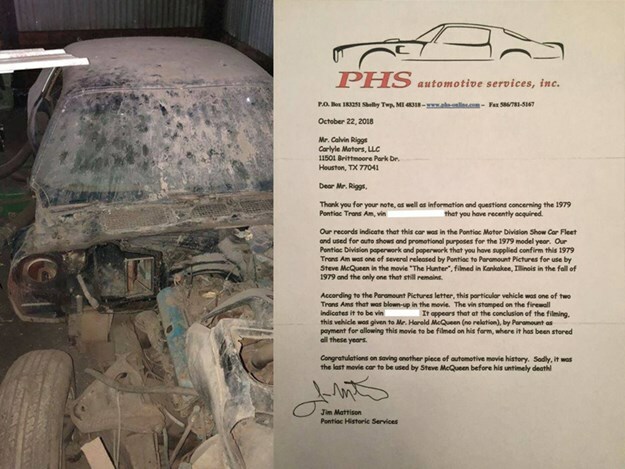 Its new owner, Calvin Riggs of Carlyle Motors in Texas is now seeking information on the car from former cast and crew members. It is possibly the last surviving car of those original six. The chase scenes in "The Hunter" aren’t as good as those iconic scenes in "Bullitt" (in our opinion), and the Trans Am plays a markedly smaller role in the plot – with its ultimate fate ending in a ball of fire while McQueen seeks to apprehend his foes. The story with this one goes that: the exploding Trans Am scene took two tries as the first take wasn’t dramatic enough. A second Trans Am was attained from a local dealership. Originally Nocturne Blue, the car was repainted Black, and altered for a more theatrical explosion (you can see the engine and subframe detach from the vehicle in the final cut). 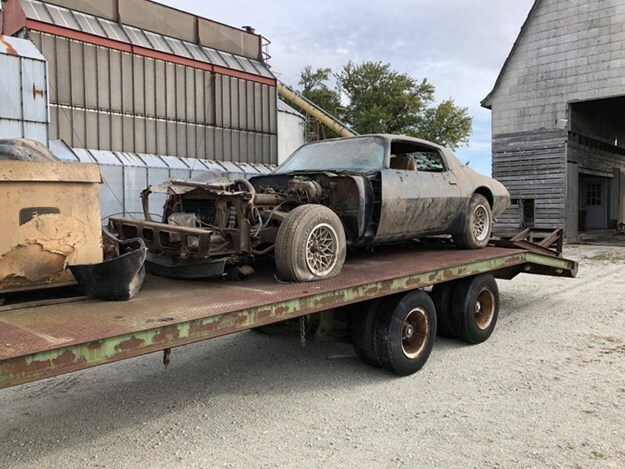 Shot in the outskirts of Kankakee, Illinois, a local farmer named Harold McQueen (no relation to Steve) volunteered to trailer the remains of the first Trans Am to a shop to swap its roll cage into the second vehicle. After the scene, Harold was given the title to the first Trans Am by Paramount Pictures, the second destroyed car was turned away by the dealership and scrapped. Pontiac reportedly never signed off on giving Harold the title to that first Trans Am, fearing it would be rebuilt and returned to the road. 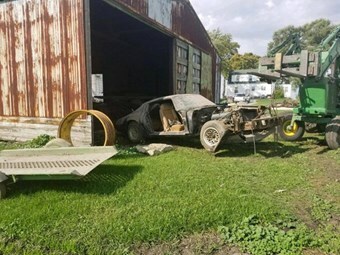 Despite pressures to return the vehicle, Harold tucked his car away in his barn with plans to eventually restore the car. 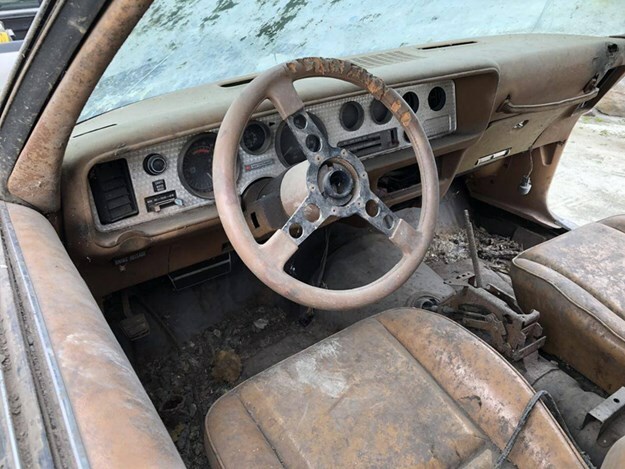 Life got in the way, and it remained in the barn until a pair of former Illinois locals who grew up with Harold’s younger sister at school – got hold of Harold with the intent on buying the car. The car’s low-milage (approximately 1,300 miles) and its chassis modification confirmed it to be The Hunter Trans Am. Unfortunately, having literally been blown up, there isn’t much of the car left. It would take a valiant effort to restore the car to road-going standards, and its ultimate fate is still yet unknown.